The most common question we get at SDSI is, “what does SDSI do?” It has always been a tough question. Originally we were focused on Action Sports; that proved to be too narrow. The result was the development of the now familiar acronym: SAL… "Sport and Active Lifestyle" companies. That was far more effective and included far more businesses. But…what do we do? The answer was we are a business development group focused on the SAL space and we promote, well, our business interests. And our Springboard program helps accelerate young companies. It's a pretty good answer: in fact we spend a majority of our time providing educational and networking experiences to the membership in different ways. In our recent past we have enjoyed a wide range of activities, Guy Kawasaki to valuation and Amazon workshops. Our revenue came from memberships. We try hard to render value to each member. Our renewal rate is our pulse, and we are healthy by all measures. But the circle was completed when our Industry Chairman John Sarkisian noted in his Holiday message that SDSI has created a business oriented healthy living community, where previously there wasn’t one. The very word “community” implies a greater collective interest and a recruitment of resources to achieve a greater good. But what do we do? SDSI is a business development community that creates companies, jobs and commerce in the Sport and Active Lifestyle space. Our membership represents the 1200 SAL business in San Diego, all of whom play a role in the San Diego Lifestyle. Our collective economic activity ranks in the Billions of dollars in Commerce. Our Springboard program is an engine of creativity having now graduated 71 Companies, helped raise $76M in capital, and enjoy an 87% successful track record. Importantly, in this amazing Year of the Woman, 41% of our graduate companies are female founded or led. And the Springboard Mentor community in this year will donate 1,600 hours of selfless dedication to helping young entrepreneurs achieve their dreams. So that's what our community is and does. We are executives, individual companies, ideas, investors, San Diegans rallying around creativity, business energy, and giving. Not Bad! Springboard Class 11 recruiting is underway. Direct your favorite young company to apply and watch the magic happen! Get your Sport and Active Lifestyle company on the fast-track to success! Apply to SDSI Springboard now to get hands-on mentoring from established mentors who have been in your shoes. Let them tell you about the mistakes they made so that you don’t have to make them yourself! Visit the SDSI Springboard Page for more information. Our best companies come from referrals so please pass along this info and/or head to our twitter, linkedin, or facebook pages and share, share, share. 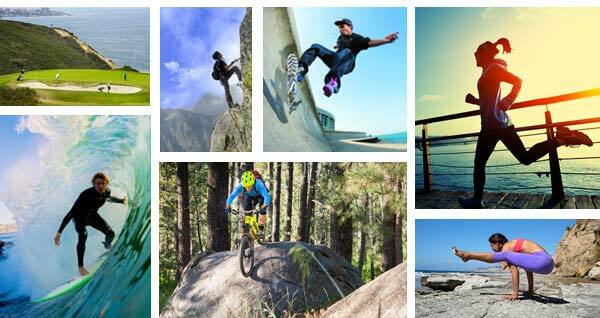 BDLG Active, Class 9 Springboard Grad, added Damien Hobgood to their roster to help spread the word about their all natural Active Skin Repair product backed by science and succesfully used in the medical community. "We're excited to have Damien join our team," said, Justin Gardner, co-founder and CEO of BLDG Active. "As a world renowned surfer and father, Damien is a leader both locally and in the global surf community. After years of watching surfers' minor nics and cuts turn into serious infections, Damien has an understanding of the importance of skin repair for anyone spending time in open water.” Read the full press release. 2017 was a busy year for ElliptiGO who did everything from fundraising to empowering customers to enhance their lives - whether it be losing weight or returning to normalcy after beating cancer! Congrats on a great 2017 and hope 2018 continues to build on the solid foundation. For a full recap, take a look at their article. Catherine Robertson, the head team physician for numerous local sports teams including the Padres, has been named chief of Sports Medicine at UC San Diego Health. “I’m passionate about keeping patients active, improving their quality of life and optimizing performance,” Robertson said. “As I continue to lead the sports medicine program here at UC San Diego Health, I’m looking forward to expanding our breadth of care as we add skilled specialists and develop our sports medicine program as the best in the region.” Read the full story. President and COO of Sony, Mike Fasulo, is more qualified than most to share his two cents on the state of technology at CES. Mike talks about the recently announced 85” 8k display, the audio offerings from consumer to professional, and the overall experience (or Kando) which Sony has been talking about for several years. The interview concludes with three very wise words at the core of Sony’s philosophy: Experience is everything. Read the full interview. This new arm targets the growing segment of outdoor/adventure sports enthusiasts. SDSI Board member and TEN president Norb Garrett said, “ASN’s editorial strategy is unique in that it will generate original content around experiences, product, gear and travel while also leveraging TEN’s twelve action-adventure sports brands (such as Surfer, Powder, TransWorld Snowboarding and Canoe & Kayak) as well as building a network of amazing third-party content partners.” Read the full press release or view the ASN website which launched today! While many parts of San Diego are thriving, jobs remain unfilled and inequalities are increasing. The region’s economy is misaligned between employer needs and workforce capability, and many individuals face barriers to upward mobility. Join San Diego Regional EDC on February 15th at the Jackie Robinson YMCA for a luncheon with special guest Amy Liu, vice president and director of the Metropolitan Policy Program at the Brookings Institution, for a discussion about inclusion as an economic imperative. Register here. Does anyone know who you are? Beginning in late 2016, companies began to remember the importance of having a strong internal marketing team. After spending years outsourcing their branding, digital, lead generation and social media marketing, we have seen a significant uptick in the number of companies investing in their internal marketing group. No one knows your company and brand better than you and your internal team. Without a dedicated marketing expert on staff, you run the risk of becoming obsolete, as your competitors expand their marketshare through relevant & memorable marketing! The average Marketing Manager in San Diego earns between $75k and $100k and the right hire and marketing strategy can return 10x this in new business. Contact Ken Schmitt for a free copy of our 2018 Sales & Marketing Salary Guide.